The Fearless Athlete is 14-day step-by-step easy-to-apply mental training program designed to help you overcome the mental barriers of perfectionism, fear of failure, and learn to perform with unbeatable trust. You learn how to overcome performance anxiety, trust your practice and perform freely in competition. 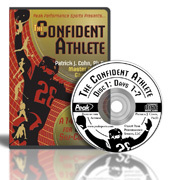 This program consists of 2 audio CD’s and a workbook you use for just 15 minutes a day! Each copy comes with two premium bonuses that you can download immediately!